Have you ever stood in a public place and wondered what it would look like if you could peel back the layers of time? If you could grab a corner of the present and pull it back like wallpaper to catch a glimpse of a previous year, or a decade, or even a century? What might you find just beneath the surface of the Right Now? From the collection of Mark Sakagami, used with permission. This remarkable photograph was sent to me by Mark Sakagami, a direct descendant of the family pictured. He recently came across this photo in a trunk and recognized the infant in its center as his father, dating the photo to 1921 or 1922. 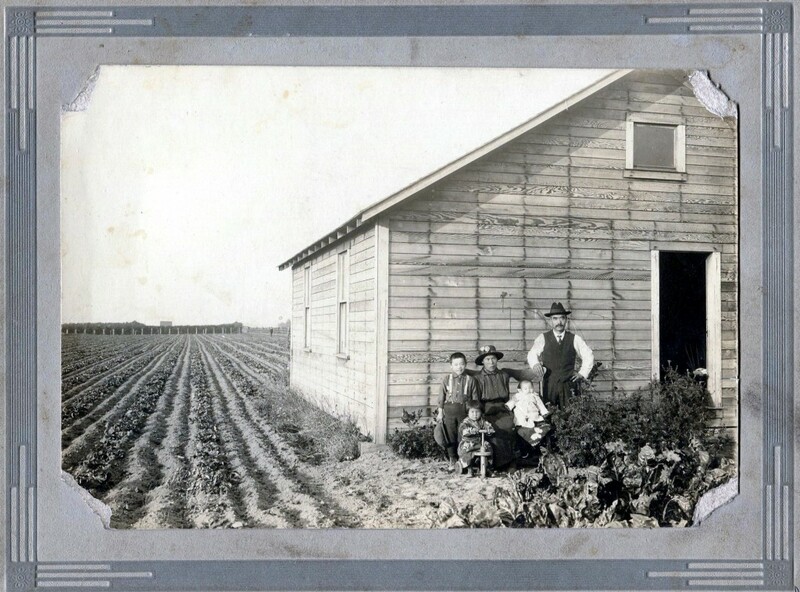 His dad is pictured here with his own parents and siblings at their family farmstead. Mark was good enough to send in a copy; I'm so glad he did. What's remarkable about this photo, in addition to the irreplaceable family images at its center, is its indisputable sense of place. Although this is western Washington, there's not a tree in sight. Instead, we can see a fenced area in the far background, probably a berry crop of some sort. In fact, every inch of land in this scene is under cultivation. Not a scrap of yard surrounds the unclad little house; the plowed furrows come right up to its walls. The small space in front appears to comprise a vegetable garden, probably grown there for the family's own use. In 1922, Issei Japanese like Mark's grandparents were prevented from owning or even leasing land in their own names by our state's racist alien land laws. The Sakagamis were instead tenant farmers, growing potatoes and making use of every last inch of land that they could just to make ends meet. There is something desolate about the house, naked of paint or even siding, and even about the field, leveled and lined into maximum production. But at the same time, there is a balance of hopefulness in the Sakagamis themselves, posed as they are for this informal portrait. They've dressed in what are probably their best clothes; they've brought a chair outside to better position themselves for the cameraman, and they seem somehow content there as they look toward the photographer, and beyond him to the road, and beyond it to the little cemetery where they have already buried a lost loved one. They have, in so many ways, put down roots in this strange land, this less than welcoming place. Do you think they could have imaged a day when everything they saw around them would be sealed under pavement? When their farm would be buried under a store that existed solely to sell impractical things like grass seed and lawn sprinklers, insect candles and gnome statues? 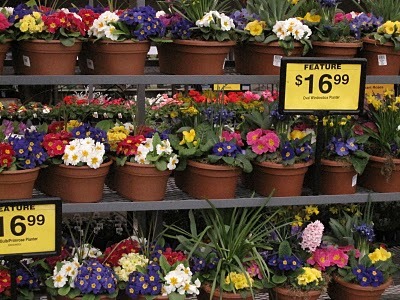 Extravagancies like petunias and pansies? We wander through such wonderlands every day, rarely even thinking about the pedestrian miracles that have already come to pass. Those wonders will remain forever imperceptible to those of us who refuse to cultivate our sense of place. Matajiro Sakagami (the patriarch pictured in the center of the photo above) was the father of a female infant who was born in September of 1907; she died about a week later. There is a Sakagami grave in Row 6 of the Auburn Pioneer Cemetery, putting it in a section of graves that was actively used for Japanese burials in the first decade of the 20th Century. Although there is no given name recorded for the Sakagami infant who died in 1907, the first name on the stone was translated in 2008 as "Yoshi." It's likely that the Sakagamis' baby girl who was born and died in 1907 occupies this grave. The Sakagami farmstead was located directly across the highway from the Auburn Pioneer Cemetery.